The Sun Fire V1280 is a reliable, high-performance server featuring up to 12 UltraSPARC processors and 96GBs of memory. The server can use one, two or three processor boards containing four UltraSPARC III Cu processors of the same speed. However, you can configure your system to hold four, eight or twelve processors at mixed speeds. Custom Configure your V1280 now or request a quote on upgrades and/or parts, or contact us at info@vibrant.com or 888-443-8606 with any questions. 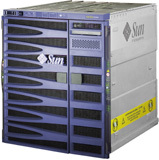 For pricing on new or used Sun Fire V1280 servers, upgrades or parts, please contact Vibrant sales at sales@vibrant.com or call 888-443-8606 or 952-653-1700.